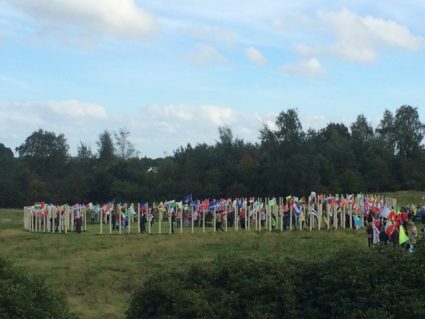 The 18th World Peace Festival was held at Allanton World Peace Sanctuary, Scotland on Sunday 11th September 2pm – 6pm. We were well prepared for all weather as we had a very large marquee which had been used for the ‘Soul of WoMen’ conference the previous day. The weather was cloudy but warm, and some of our visitors spent time walking in the grounds and looked around the lovely walled garden. Around 300 people enjoyed an afternoon of beautiful live music from local musicians: Darcy DaSilva who writes and sings her own songs, Greg Lawson (2nd violin of the Scottish Orchestra) and Pete Garnett (piano accordion), Wendy Stewart who is an internationally known harpist, Pete and Anna Tagg who played the Taiko drums. There was Aikido demonstrations and also exhibitions from many local groups. The Fair Trade Groups café provided home baked goods and drinks during the afternoon and delicious ice cream was available from Glen Urr, a small local company. The theme of the Festival this year was ‘Diversity in our Community’ and exhibitors included: ‘Freedom from Torture’, which is a group that supports people who have survived torture; MOOLS (Massive Outpouring Of Love), which is a group who help refugees in any way that they can, and DG Voice, a group who help disabled people to have a ‘voice’ in society. The World Peace Prayer Society also had an exhibition showing the work of the Society, the Fuji Declaration, the Soul of WoMen conference and displays of the ‘Peace Prevails’ school programme and photos showing a calendar of events taking place at Allanton Sanctuary since June 2015 which was our last Festival. After the Flag Ceremony, everyone was invited to pick up a flag, and (accompanied by the Taiko drums) carry it outside to the Peace Pole Henge. 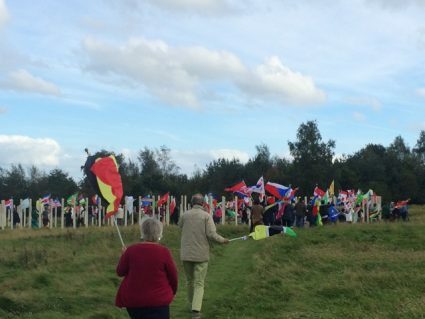 A parade of all the flags made its way to the henge and everyone walked inside and around the henge. It was very powerful and moving. 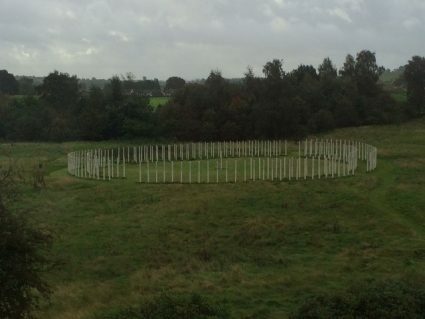 This is the first event that has been held in our newly completed Peace Pole Henge. When the flags had been returned to the marquee, it was time to enjoy Uma’s special curry and listen to music from local musicians which completed a wonderful afternoon!